anyone know of a good recipe for etoufee....doesn't matter whats in it, i just want to cool some. i know there are a few Cajuns on here, maybe some of yall can help out. Thanks guys! The French word "etouffee" means to stew, smother or braise. This technique is found in dishes using shrimp, crab, crawfish and, in some cases, meat or game. Though more Creole in origin, etouffees are found throughout Cajun country. In a 2-gallon stock pot, melt butter over medium-high heat. Add onion, celery, bell peppers, garlic and bay leaves. Sauté until vegetables are wilted, approximately 3-5 minutes. Add tomato sauce and blend well into mixture. Using a wire whip, blend flour into the vegetable mixture to form a white roux. Slowly add crawfish stock or water, a little at a time, until sauce consistency is achieved. Continue adding more stock as necessary to retain consistency. Bring to a bubbling boil, reduce to simmer and cook for 15 minutes .. stirring occasionally. Add crawfish / shrimp , sherry, green onions and parsley and cook an additional 5-8 minutes. Season to taste using salt and cayenne pepper. Serve over steamed white rice. Last edited by Cajun Blake; 07-09-2010 at 08:07 PM. Man that makes hungry. When are you coming over to fix dinner? Just tried this tonight, 6 guests said it was awesome, I loved it but I love just about any etoufee, it was very restaurant gourmet quality food. Thanks Blake. yes, that looks delicious...i think ill make some this weekend. thanks man! Wow, that looks good! I might have to try that recipe. Only thing I'd do different is the rice. Use 20-minute Uncle Ben's white rice. Determine the amount of water you need for the amount of rice you are going to cook (directions on the box). Boil that amount of water and drop a beef bullion cube in for every cup of water. Mix that up until the cube dissolves. Shake in some Cajun Blaze seasoning. Put some butter in a pan for the rice and melt it. Dump in the rice and saute the rice for a minute or two until all the rice is well-buttered. Now pour the bullion into the rice pan and stir it up, turn heat down to simmer. Put a lid on it and simmer for 20 minutes. Let it stand after that until all the water is gone/soaked up. Now, THAT's some good rice. I have to make this dish some day! Just a suggestion, did you try Basmati rice, or Chinese perfume rice, those are wonderful!!!? Really want to try this recipe. But all I could find was already cooked, ready to eat crawfish tails. Would you just drop em in for a minute just to heat em up or still cook the eight minutes? i knew blake would come thru! If they are allready cook all you want to do is heat them up which should only take a few minutes. Any longer and they will get rubbery. IMO though allready cooked ones wont be nearly as good b/c alot of the flavor in a crawfish etoufee comes from the fat on the uncooked tails which is what makes US crawfish tails the best to cook with over the Chineese and cooked ones. Looks like I'm gonna have to find some fresh bugs around Dallas. Anybody know where preferablly around Denton? Every time I make rice it comes out a sticky glob of goo. I'm following the directions on the packages but I don't thinktheir directions are supposed to yeild the gelatinous mass I manage to produce. when water begins to boil , add rice ... stir around, then cover with top and set stove temp to 2 or slightly above "low"
In a stock pot, melt butter over medium heat. When butter is bubbling, add flour to make a roux, stirring constantly to prevent or remove any lumps. Cook the roux for 5 minutes. Do not brown. Stir in onions and bell peppers; saute 10 minutes, or until onions are translucent. Add garlic, and saute for 3 minutes. Stir in crawfish tails. Slowly pour in enough water to reach a little thicker than soup-like consistency. Season with cumin, Worcestershire sauce, hot sauce, and salt and pepper. Reduce heat, and simmer for 10 minutes. Whoo tried it and loved it thanks Cajun blake. That's an awesome looking dish. I've not seen one without an cream based sauces. Quick question. I love seafood dishes, but never have the guts to cook them. 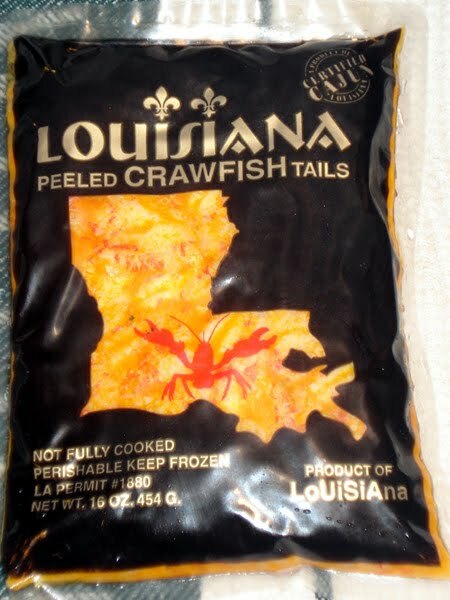 I dont know if the local HEB has the crawfish tails. But if it does, do I get crawfish tails and clean them out and use those tails and boil them in water to make the 2 quarts of crawfish stock. And what about if I would like to add shrimp to it? nothing to be afraid of brother, just get in the kitchen and follow the recipe directions..... cooking is very simple . if possible, buy Louisiana crawfish as the tails are peeled and come in a 1 lb. vacuum sealed bag. LA crawfish are farm raised to be fuller and have more meat, as you can definitely taste the difference from imported crawfish. LA crawfish tails are already cleaned, peeled, and de-veined. LA seafood processors have to have a permit and meet strict gov't regulations before their food product can be sold to the public. Chinese crawfish have flooded the market are are much smaller and tatse "mealy". China does NOT regulate the farming industry and for all we know, these crawfish could be raised in a sewer with chemicals added. 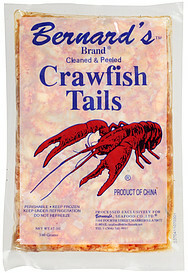 On avg., peeled LA crawfish tails will cost $8 - $10 per pound, as Asian crawfish sell for $4 pound. You can easily substitute shrimp yet buy local and avoid the imported stuff. You get what you pay for, and not worth ruining a meal by saving a few dollars to buy a lesser quality product. Crawfish stock is made by boiling the shells & heads to get flavored water. It's not necessary for the etoufee' as you can use regular water. For shrimp etoufee', you can use the shells & heads to make a stock, or just use powdered shrimp which also makes a seafood stock. Certified LA product, with permit number on packaging. Last edited by Cajun Blake; 01-20-2011 at 02:18 PM. Well, I tried it last Friday. It came out awesome. I didn't find Louisiana crawfish but cooked it anyway. I used 1 pound crawfish and 1 pound shrimp. I can't imagine how much better it would of come out if I would of used the non-imported crawfish. Thanks!! You guys are all making me hungry. Actually, using it as a sause over fish or steak sounds like a great idea. THis is excellent over steak but a crawfish cream sauce is even better imo over a ribeye and only takes about 10 minutes to make. sautee onion, garlic, bell pepper. add whipping cream and crawfish along with seasoning. reduce cream down to about half. Turn fire down to warm and add diced greenn onions and let mixture thicken. Pour over ribeye. Last edited by RaginCagin; 02-10-2011 at 02:17 PM. Ragin Cagin- I made this for my wife on V Day. It was absolutely outstanding. And easy to make. Served it over rib-eyes. She couldn't get over how good it was. Said it was "restaurant quality". glad you liked it man. I cooked 15 lbs of crawfish for some of our vendors last night in a etoufee and got a few packs left so i think i will have to make a little cream sauce for some steaks this weekend. I got a WHOLE book of recipes when I was visiting with Blake last summer!!!! We have ribeyes covered in etoufee' for our Christmas meal... We're done it the last 4 years and love it over the traditional turkey and dressing. The other entrees change a little, had stuffed flounder this last year. Delish! Chicken and sausage instead of crawfish is awesome, then it become a sauce picante. One of my favorite meals. these recipes sound so good! got to try one! Bumping this to the top. I have just enough crawfish left over to make it. Ragin' Blaze baked tilapia. Smothered in crawfish étouffée. Delicious!